"It’s machine washable and can go into a clothes dryer." If you live in a chilly climate or in an a home with poor insulation, you know what it means to get cold at night! For these homes, you want high loft (meaning lots of material between the outer layers) and a material that will hold in heat, like down, down alternative or wool, to help you get and stay warm for hours on end, so look for a fluffy box-stitched quilt to do the trick. This one is made from 100% polyester and a down alternative to make it both hypoallergenic and more affordable and can be used with or without a duvet cover. What's more, it’s machine washable and can go into a clothes dryer, as well! If you live in a place with a real change in seasons, look for a midweight quilt that will be comfortable when it’s warm out, but that’s easy to layer in the colder months. Choose a quilt in a solid, neutral color to give yourself the most flexibility as you transition through the seasons: In summer, pair it with lightweight cotton or linen sheets, then in winter trade in flannel sheets and top it with an extra throw blanket or duvet if you need more warmth. One with interesting stitched details, like this, will still be pretty enough for your bed to look decorated without limiting your options as you change out other bedding elements. This medium-weight quilt comes in four tasteful colors with varied stitching options for every taste and includes two matching pillow shams. Handmade patchwork quilts are a part of American heritage, but if you don’t happen to have a talented friend, these works of art can be out of most people’s budgets. If you like the look, go for a machine-made version in a traditional pattern to give you room a heritage feel without the big price tag. Like artisan-made quilts, the top of this one is also made in a piecework style and done in a mix of antique-inspired floral print. It’s made of 100% cotton, a hypo-allergenic and comfortable material for multiple seasons, and the quilt is oversize to work with taller mattresses and comes with two pillow shams. It comes prewashed and pre-shrunk and is reversible, too. While many quilts tend to be more traditional in styling, not everyone’s tastes run that way. With a patchwork feel done in more modern fabrics and colors, this quilt will fit in perfectly with more contemporary and trendy homes than the traditional patchwork style. It’s available in four color schemes, including black-and-white for people who love pattern (but not color) and three more colorful versions in blues, purples and reds. With the mix-and-match materials, it can easily set the tone for the room and work with a range of furniture and rugs. This medium-weight quilt set is 100% cotton and the basic version of the set includes two matching pillow shams, with options to add two or four additional pillows to further decorate the bed. A warm, cozy quilt doesn’t have to be expensive. In general, quilts made with man-made materials, like microfiber and polyester, will be less expensive without sacrificing on warmth, softness or style. If you’re trying to make your money stretch further, choose one in a solid color you love with classic, unfussy stitching that can carry you through rounds of redecorating or work in different rooms over the years. 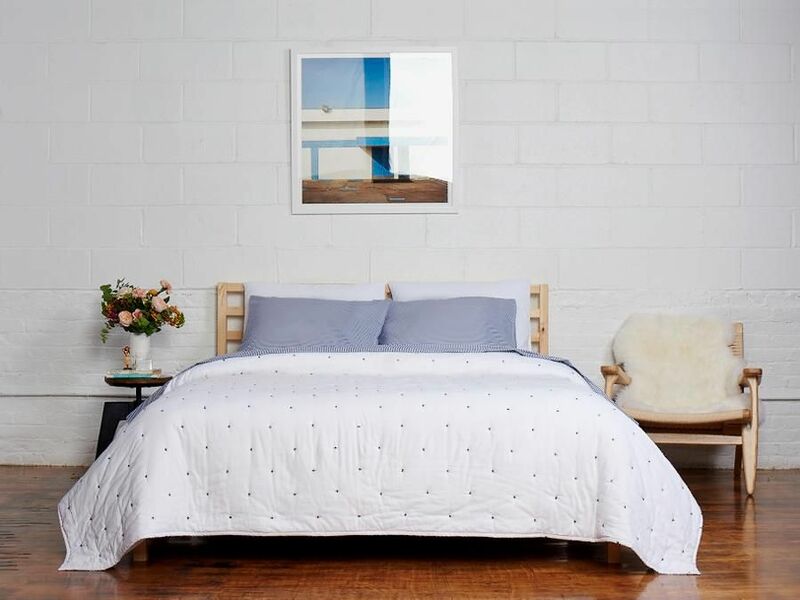 This silky-soft quilt set (it includes shams as well) is oversized, meaning you have a few extra inches all around — a great option to cover the whole bed when you have a taller or pillow-top mattress on top of a box spring. It comes in more than fifteen colors to find the perfect shade for your home. Whether you live someplace warm or like to throw the windows open come summertime, a lightweight quilt is a must to be comfortable in the nighttime chill or with the air conditioning going. But you’ll want to stay away from heavier materials like wool fill or densely woven outer layers so you don’t get too hot. This quilt is made of 100% cotton in both the fill and outer layers, so it provides a little bit of warmth but still breathes, and won’t hold on to humidity. It’s made by artisans in India (a country that gets very, very hot) using a traditional weaving method called “kantha” and takes six days to make. It’s super-soft and can be used alone on the bed for hotter days, or layered under or over a duvet when it’s really chilly. Once your child is old enough to have bedding in his crib, look for a lightweight quilt that can work in the crib and toddler bed by itself or as a layering piece. Choose a super-soft version made of 100% cotton and a lower-loft fill to keep your child warm without getting too hot. A lightweight version can also fit into your home washing machine to clean it when your child has an accident or an illness. Choose one in bright white that can be bleached if need be (because you know with kids, some kind of stain is inevitable!). The bonus with all-white: It will continue to match your child’s room decor and other bedding as their tastes change from one character or hobby to another. If you don’t like all-white, this one also comes in gray, blue and pink, or just with blue or pink borders. We bought a top-rated quilt and our reviewers tested it for 56 hours. We asked our testers to consider the most important features when using this quilt, from its design to its material and weight. We’ve outlined the key points here so that you, too, know what to look for when shopping. Material When buying a quilt, make sure to look at what material it’s made from, as this plays a key role in its performance. Wool and microfiber quilts are warmer, while cotton quilts tend to be lighter and more breathable. The material will also dictate how easy it is to wash the quilt. Weight Quilts are often described as light-, medium-, or heavy-weight. This denotes a quilt’s warmth, as well as the seasons and climates in which it works best. Heavy-weight quilts are ideal for cold winter nights; lightweight quilts, on the other hand, are a go-to for summertime. Design One of the great things about quilts is that they come in a wide variety of colors and designs. There are plain quilts made from just one fabric, and there are patchwork quilts that feature intricate designs. When you’re shopping, consider your home’s decor and find an option that complements it.